I just graduated from Missouri Baptist University in May 2017, majoring in Music Ministry with an emphasis in Piano concentration. I have loved music all my life, especially classical, jazz, and Contemporary Christian, and love continuing to be exposed to new kinds. I currently serve as worship leader at Cross Keys Baptist Church, and have played at other churches in the area, as well as nursing homes. I have studied with several classical piano teachers, including Dr. Cathy Benton at MoBap, and with local St. Louis jazz pianist Tim Garcia. In my personal life, I also enjoy the outdoors, reading, and telling clean jokes, mostly music ones, as I believe everyone needs a sense of humor! Give us a call to set up a first lesson with Sam today! 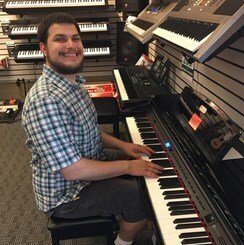 Request Lessons with Samuel today!